Is My Roof Good for Solar? The first thing to know about paying for solar is that whether you pay cash or finance with a loan, you probably have the money already. Let us help you shift what you’re already paying the utility for electricity into your own clean solar. Solar today is accessible to anyone with an acceptable credit rating, thanks to solar loans, many of which front you 30% of your system price (equal to the amount of your federal tax credit) at no interest for a year. The remainder is financed at a low interest rate with a variety of term options. We also offer the Mass Solar Loan. Paying cash gives you the greatest financial return. (What a surprise!) However, the return is still excellent if you finance with a loan. Your actual price for solar depends on factors like how many panels you want and which panels you choose. Your payback time frame depends on variables like your electricity rate and how much solar electricity you make and use. Our free proposal details your financials, including incentives offered in your state. For example, Massachusetts, Rhode Island and New Hampshire have programs that slash thousands off the price of a solar energy system. And a federal income tax credit worth 30% of your system’s price lops thousands off your starting price. See our FAQ for more on solar financials. Regardless of your system price, and unlike just about any other home improvement, solar actually pays for itself, giving you back every penny you spent. 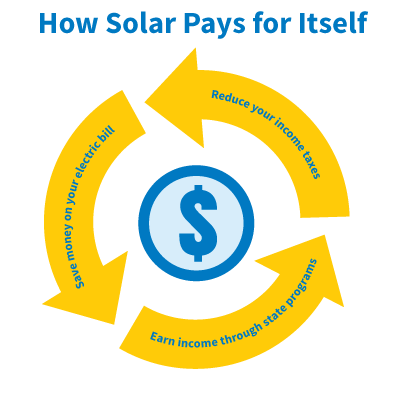 Solar pays for itself by saving you money on your electric bill, reducing the income taxes you pay, and/or earning income through state “green” programs. Whether you buy solar with a loan or cash, after the system is paid for, you have free electricity for decades more. Your total financial return over 25 years is approximately 200% of what you spent to buy your system. Now that is a better alternative! Clean Energy doesn’t provide “instant quotes” over the phone, or via a snazzy online calculator. Those calculators can be fun and give you a general sense of what solar might do for you, so test one if you’re so inclined. Our systems are custom-designed, not cookie-cutter, based on your actual roof and rafters, not a grainy online image. We put together proposals based on accurate data (your electricity usage, roof size, roof azimuth and pitch, shade readings, etc.) so you can have faith in the estimated savings, income and payback time frame detailed in your proposal. We do offer a residential solar lease as a way for you to get solar on your roof. It works best for those who pay little to no income tax.